Keb’ Mo’ takes the stage at the bergenPAC in Englewood. 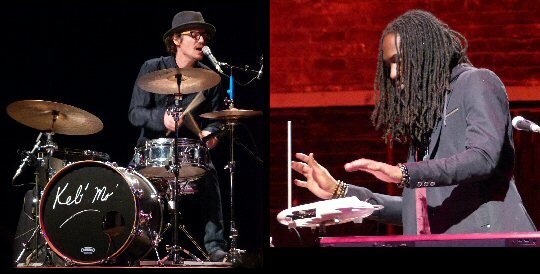 Keb’ Mo’s band at the bergenPAC featured Michael B. Hicks on keys, bassist Stanley Sargeant, and drummer Casey Wasner. All three were strong singers and have their own projects in the works. 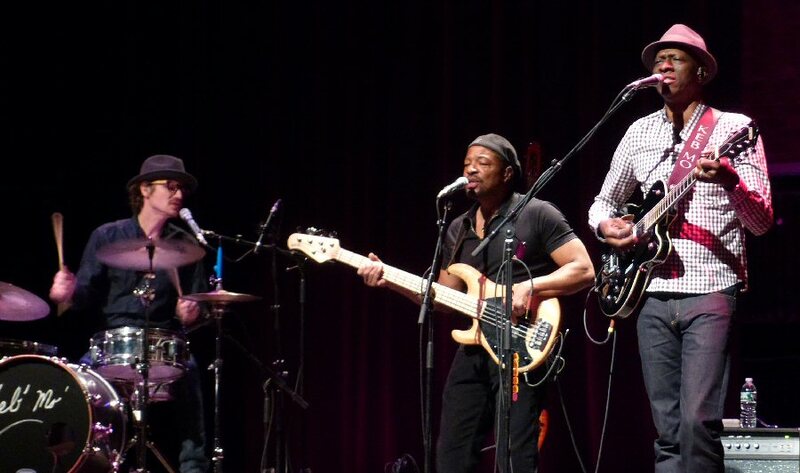 In addition to supporting Keb’ Mo’ Michael B. Hicks collaborates with an impressive list of other artists and is the front man for Mike Hicks & Funktional. Stanley Sargeant also has an impressive resume having worked with a wide range of musicians including Barry Manilow, Dolly Parton, The Jazz Crusaders and many more. Casey is an in demand player who co-produced Keb’s BLUESAmericana record. Keb’ Mo’ with his talented trio received a warm reception as they took the stage a little after eight on Friday night. They opened with the peppy and positive “Let Your Light Shine” a tune that encouraged its listeners to tap into their potential which Keb’ did with the first of many fluid guitar solos. Keb’ has a deep communicative voice that is well suited for the blues and more. Next, fans clapped along to a sassy “Rita” which blended the swagger of the blues with soul. Keeping with that mood the quartet slowed it down for a homage to “Riley B. King”. Keb’s fine fret work echoed of the magic of the late B.B. King. The Keb’ Mo’ band were enthusiastically greeted in New Jersey. “Tribute to the best dairy products,” jested Keb’ as they presented tales of hard times in “Gov’t Cheese” topping it off with cool keyboard effects. “Somebody Hurt You” off the BLUESAmericana album showcased beguiling guitar riffs and rhythms with the band providing fine backing vocals before fans began shouting out song titles. One request was for “Rainmaker”. Keb’ joked that he was only two went he wrote it back in the late 1970’s. The tune had a more subtle arrangement that was filled with images of weather and a woman. Keb’ Mo’ played a few acoustic numbers before returning to the electric for snappier songs such as “The Worst Is Yet To Come” (BLUESAmericana), which was up-tempo despite the dire predictions that were punctuated by dazzling leads and keys. “The Old Me Better” had a bit of everything – Dixie, jams, slide, kazoos and even a bit of a Hot Tuna flavor. “Dangerous Mood” was daring and expansive. Keb’ Mo’ kept the energy high for the encore “She Dance” which had fans on their feet moving to the good grooves of the tune. Keb’ Mo’ played plenty of classics along with his contemporary songs on an array of guitars that added to the moods of his material. He was both an expressive guitarist and vocalist supported by a strong trio of musicians. They presented a wide range of styles from funk, rock and soul all in the context of the blues. 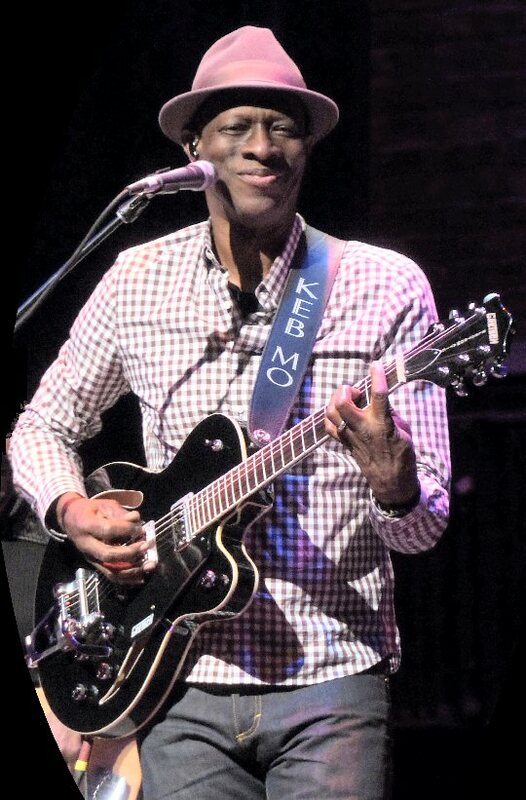 The bergenPAC continues to host a broad range of acts such as Keb’ Mo’. In addition to being an entertainment anchor in the town of Englewood the bergenPAC also supports educational programs in culture, dance, music and theater. Their Limitless Arts program offers a full schedule of classes for children and teens with special needs. Upcoming events at the bergenPAC include Dion, the Little River Band, Jessie’s Girl, Silvestre Dangond, the Big Apple Circus, Girls Night The Musical, Deep Purple and the Indigo Girls. Musical magic at the Keb’ Mo’ concert.